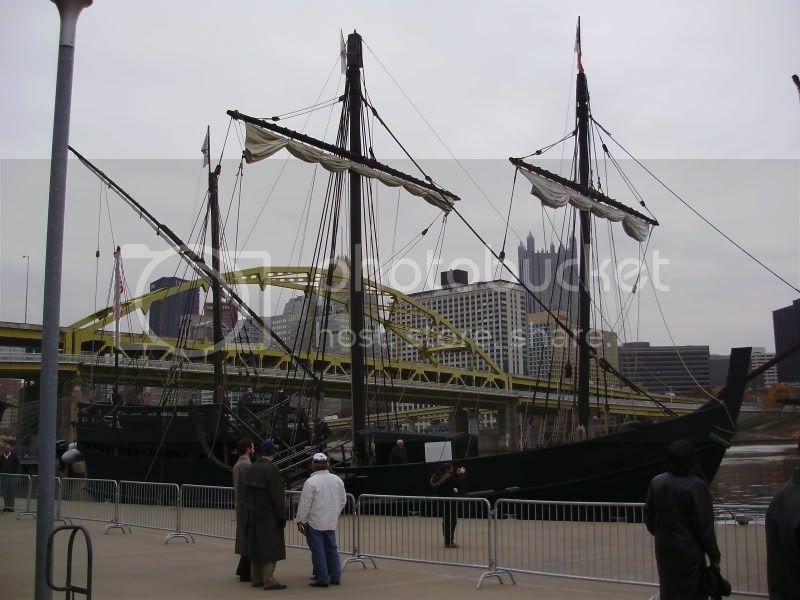 Found out today that the replicas of the Nina and Pinta are in my home port o' Pittsburgh, PA for the next week! It's too bad they can't sail to this part of the inland. Not only would I love to see them (although apparently they sailed up the Ohio a month ago, and I was too busy to drive the two hours to see them then), it would be spectacular to see them with a copy of the flagship we have here. 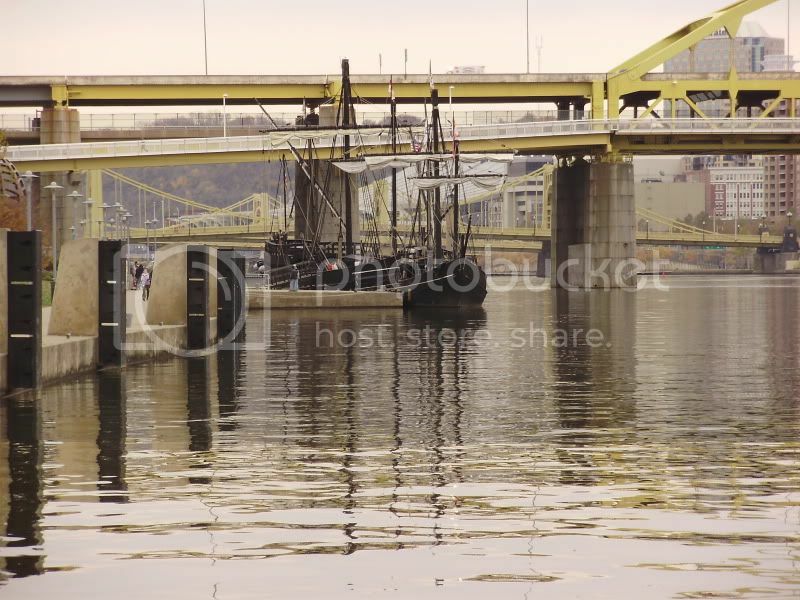 They are going back down the Ohio in a couple of weeks. Want to catch them at Gallipolis on the 21st or 22nd? Teehee...could get a fair distance with one of them little ships couldn't ya? be this the same quartermaster james from over on frontier folk? i mean, whimpering ponsies and stalker ex-gf message board? it is i, blackfish! Fascinating, isn't it, how the colonials obsess over pyrates? well, its only "certain people". theres a lot of good reenactors over there, they just usually tend to keep their mouths shut, and the snivelers have the run of the place. my psycho ex-gf joined there just to harass me, and she's always trying to trash me on it. she's a liar and a hypocrite though, i could tell you some stories lad , plus, theres a gaggle of em who make it a point to counter every post i make with some stupid tripe about their "feelings" and politically correct nonsense. right! come on lad, theres pyratin to be done! argh! The Nina was out thisaway late last year and I had a chance to check her out. And all I have to say is... holy crap - that's a small ship! It's hard to believe a complement of twenty-four men sailed on her for the months it took to cross the Atlantic. And it's not as though they spent any time below; nope - that was for the stores. The deck length was 66 feet and everyone had to share space (sleeping, eating, sailing, repairing, etc.) with a fourteen-foot whipstaff and their ship-to-shore boat (which took up quite a bit of deck space; this was no small dinghy.) And her hull design guaranteed that she would have had a horrible time yawing - I expect that the men spent a lot of time hanging over the side and "feeding the fishes" in rough weather; heck, in not so rough weather. Did I miss a chance to take offense? of course, you should be offended by my very existence! i saw you over with the ponsies and spake as tho ye were not a pyrate, then i logged in here and see you be a moderator, thats all. The Santa Maria was the largest of the three. Ships were rated in tons (according to how many tuns could fit in their hold). The Santa Maria was a bit over 105 tons. Ours was designed around this and can hold around 105 tons. 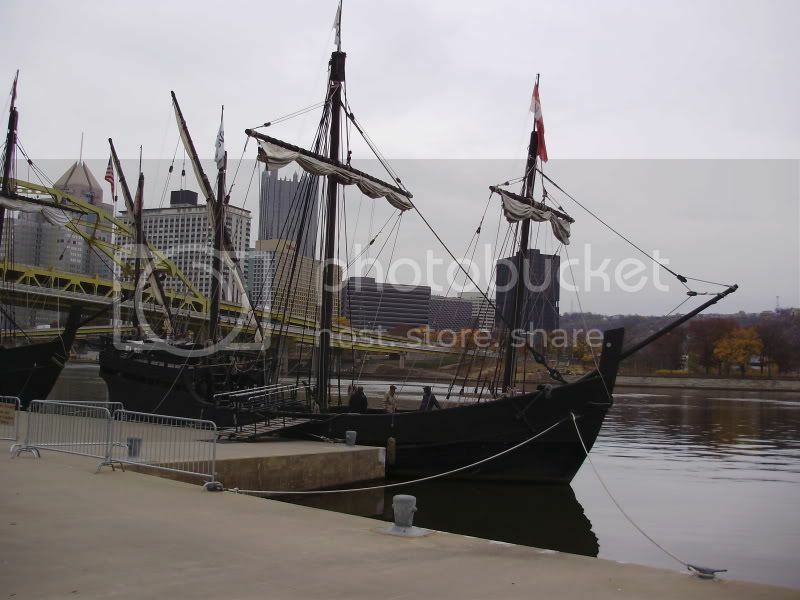 The Nina and Pinta were smaller - around 65 and 70 tons or 2/3s the capacity of the Santa Maria. Also, they were caravels and the Santa Maria was a nao (ship). Caravels were often lateen-rigged and had much less superstructure. The quarterdecks were much smaller and they had no cabins. However, most pirate ships were fairly small. The Santa Maria is larger than most pirate ships. The sloop was the favorite of pirates and 100 tons was the usual upper end for sloops. Funny thing - not long after the Santa Maria was christened, a woman came on board, looked the ship up and down and announced, "My son crosses the Atlantic in boats a lot smaller than this." I have fond memories of the Nina. back when I was really young, before I knew anything about the pirate community and kids gave me grief over my obsession, it was anchored in Fairport Harbor near my hometown. My mom and dad took me and i even wore the pirate costume I had at the time! inspired by Jim Hawkins, of course, and made friends with one of the sailors on board named Daniel. we had a lot of fun. I was so sad to leave but at the end, I couldn't believe it, Daniel gave me his monkey's fist necklace! For many years I wore it, until i outgrew it and had to cut it off. i still have it though. I stepped aboard the Nina years ago while it was visiting San Fransisco Bay and that was my same reaction. The term 'close quarters' becomes a profound reality when you stand amidships on the Nina. There really isn't much fore and aft to be amidships on a ship of that size, but what a beautiful little ship.